병풍은 전체 6폭으로 구성되어 있으며, 가운데 4폭은 신사임당의 자수 작품이고, 양끝의 2폭은 의재(毅齋) 허백련(許百鍊)의 제찬(題讚)이 있는 그림이다. 병풍 한폭의 크기는 가로 44.5㎝, 세로 152㎝로 1폭은 바위에 국화를 그린 묵화이며, 2폭은 나무와 나리를 수놓고 나비가 날고 있는 모습을 색을 입혀 그렸다. 3폭은 나무와 꽃이 핀 모란을 수놓았으며 그 위를 나비가 날고 있다. 제 4폭은 나무와 꽃이 핀 철쭉을 수놓고 그 위를 날고 있는 나비를 그렸다. 5폭은 나무와 꽃이 핀 국화를 수 놓고 벌이 날고 있는 모습을 색채화로 그렸으며, 6폭은 바위와 나무와 대나무를 그린 묵화이다. 그림의 하단에는 화가인 허백련이 쓴 칭찬글이 실려 있다. 자수는 흰색 명주바탕에 미색, 노란색, 푸른색, 자주색, 밤색 등의 꼰실을 써서 만들었는데, 자수의 최고 작품이라고 할 만하다. 신사임당은 산수와 포도, 풀과 벌레를 잘 그렸다고 하며 자수에도 능하였다고 한다. 특히 이 초충도는 신사임당의 작품으로 알려진「초충도」(동아대학교 소장)와「사계분경도」(허동화 소장)와 수법이 일치하여 신사임당의 작품이라고 하는데 무리가 없는 듯 하다. 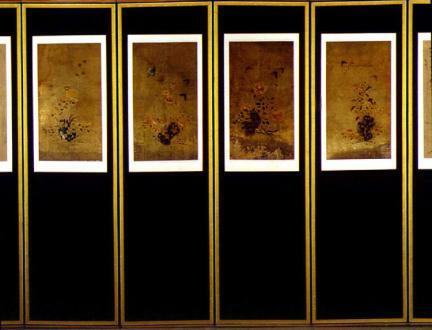 This folding screen consists of six panels. 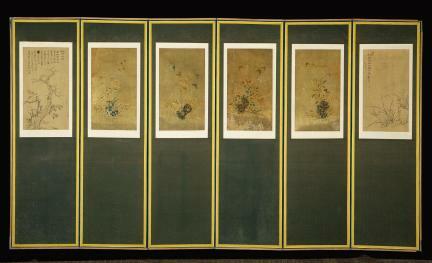 The four panels at the center have embroidery works by Lady Shin (pen name Saimdang), a Korean artist and calligraphist and the mother of Confucian scholar Yi I (pen-name: Yulgok). The two panels on both ends have a painting with a eulogy written by Korean painter Heo Baek-ryeon. The size of each panel is 152 by 44.5 cm. 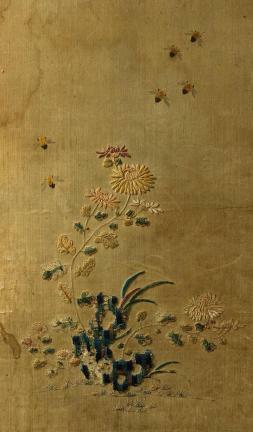 The first panel has a black-and-white drawing of chrysanthemum blooming on a rock. 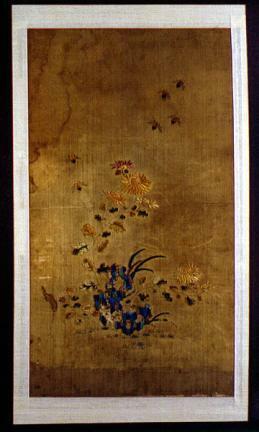 The second panel has the embroidery of trees and lilies with flying butterflies painted in colors. 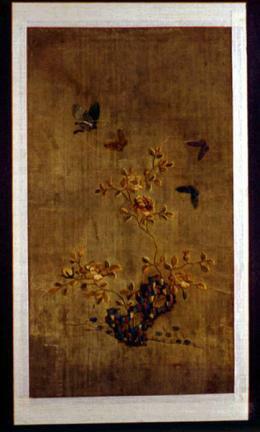 The third panel has the embroidery of trees and peony with the painting of butterflies flying over them. 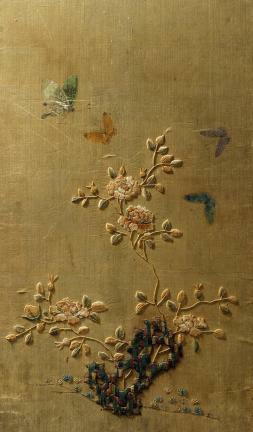 The fourth panel has the embroidery of trees and royal azalea, and the fifth panel, the embroidery of trees and full-bloom chrysanthemum with flying bees painted in color. 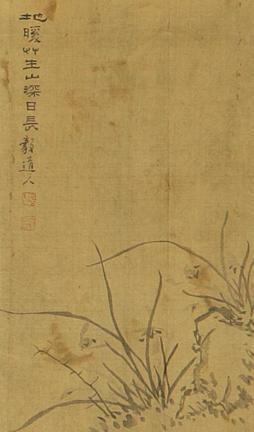 The sixth panel has a black-and-white drawing of rock, tree, and bamboo, below which is a eulogy written by Heo Baek-ryeon. 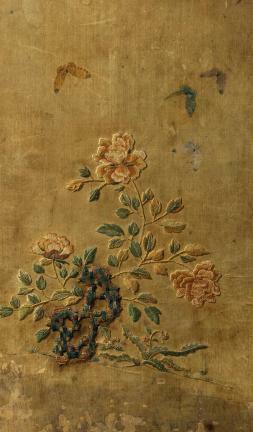 The embroidery is done on white silk using twisted threads of various colors such as off-white, yellow, blue, purple, and brown. This work is nothing less than a masterpiece. 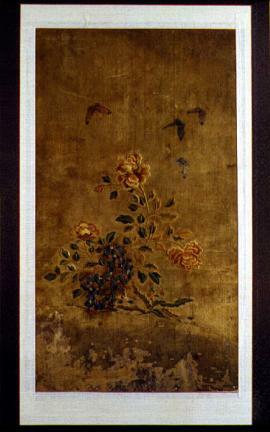 Lady Shin is said to have been especially good at painting landscapes, grapes, grasses, and insects as well as embroidery. 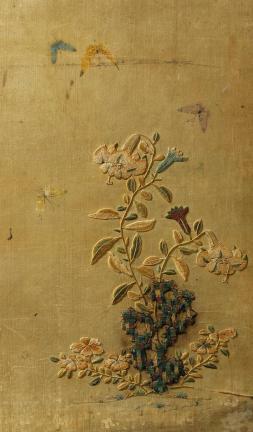 The technique shown in these flower-insect paintings is identical to that employed in other “Grass and Insects” (in the custody of Dong-A University) and in the “Four-Season Landscape” (in the custody of Heo Dong-hwa), which are known to be Lady Shin’s works. 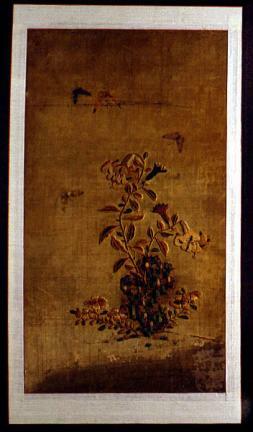 Therefore, this work is presumed to have been created by Lady Shin.